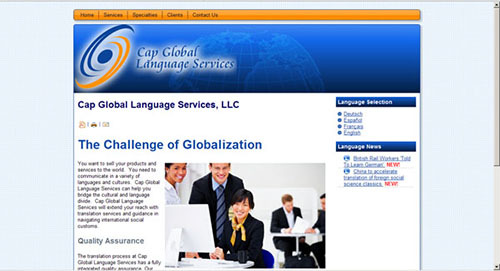 Cap Global Language Services, LLC of Marietta, Georgia. Site built in Joomla with custom theme based on company logo. A translation company needs to show their prowess in various languages. This website is translated into 3 additional languages that can be selected with a single mouse click. Interactive contact form keeps spam down. SDOC provides hosting and email services and has been proud to support this locally-owned business for five years.